The weather brought an unexpected bonus yesterday: with the local village coop low on stocks – almost no fresh fruit and veg, no bread and no milk – and an unwillingness to venture further afield, I was thrown back into what is anyway now my favourite way of cooking. I call it ‘what’s in the cupboard cooking’, though I include what’s in the fridge in that (and if needs be the freezer, but that usually means meat or fish and this concoction was for one of our two a week ‘veggie’ days – Friday). Having been to Leeds Kirkgate market recently I had a lot of avocados (six for £1 – irresistible). I usually eat them uncooked (I just love them with a simple vinaigrette) but on a snowbound day I thought a warming soup was more appropriate. Thinking how well this strange fruit goes with something hot spicey, like in a good guacamole, I decided on a hot and spicey soup. Also, as it was to be a main course, I wanted it really thick and also added a few chunks of separately boiled potatoes. Petronela, not the easiest person to please with something new to her, declared the result to be a “super soup” so here’s the recipe. We didn’t need anything more for our evening meal except freshly baked wholemeal bread but you could serve much smaller portions, without the potatoes and even cold, as a starter. As usual, measurements are approximate as I rarely measure anything (vary the amount of the ‘hot spicey’ things, or leave them out, to suit your taste). Cut the spring onions, ginger, garlic and chilli pepper really fine and sweat in the oil with the cumin for a few minutes on low heat (taking care the garlic does not burn). Add the vegetable stock and simmer for five minutes. Add the ground coriander. Destone, skin and cut the two large avocados into chunks and drop in a liquidiser. Add the stock and liquidise till it’s a smooth cream. Can be left till required at this point. To serve heat gently till just at boiling point. Slice and skin the small avocado. When the soup is hot stir in a couple of good tablespoons of sour cream. 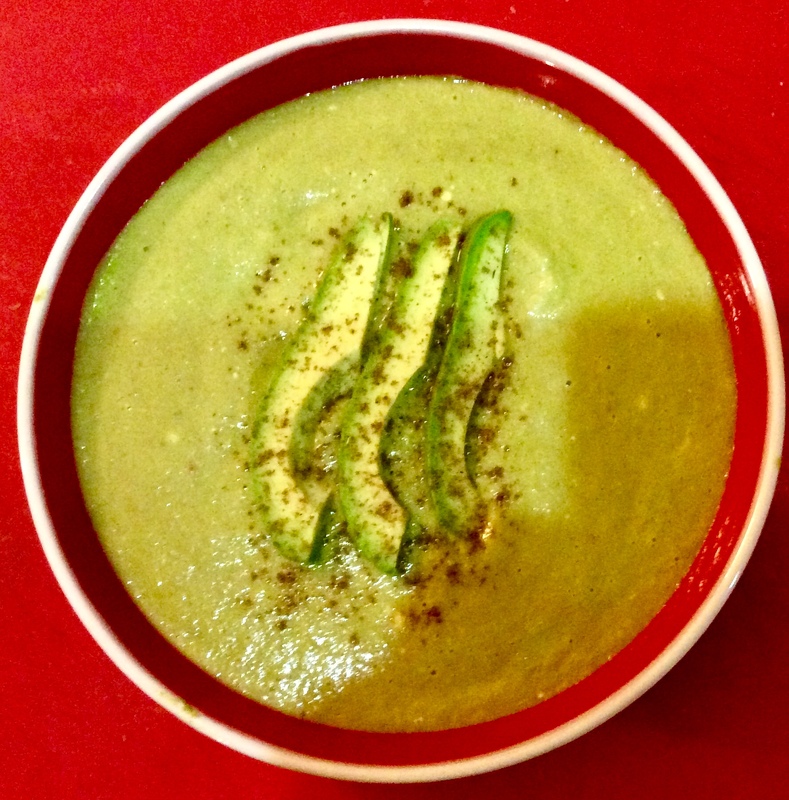 Ladle into hot soup bowls, float the slices of avocado on top and sprinkle a little chilli pepper on top. To make a more substantial meal cube some potato (preferably the soft floury type rather than waxy) and boil in salted water until just cooked. Put a serving of potato in the soup bowl before adding the soup. You could try stirring in some cream cheese, or creme fraiche, instead of sour cream. If you don’t want vegetarian soup, use chicken stock in place of vegetable stock. Decorate with fresh coriander leaves if you have them; I did not.